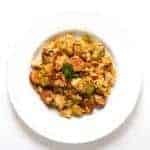 Easy Chicken Jambalaya Recipe. 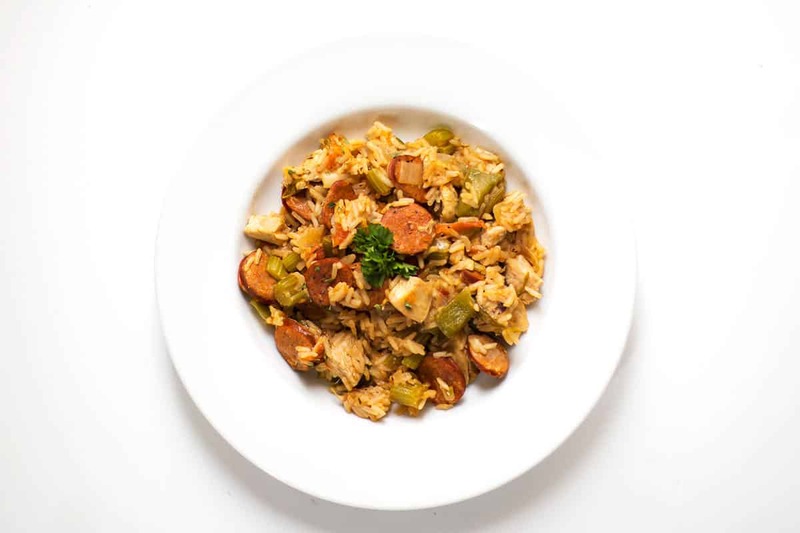 Jambalaya is a traditional Louisiana Creole dish of Spanish and French influence. It’s a creole version of paella. Season the chicken with cayenne pepper, garlic powder, paprika, black pepper, onion powder, oregano and thyme. Heat 1 tablespoon vegetable oil in a large heavy Dutch oven over medium heat. Cook chicken until browned all over. That sounds amazing. I cannot wait to try your awesome recipe. Jambalaya has never been my favorite because of what goes in it. But everything you make on this blog just looks outstanding and I need to try it. Now this would be a really fun recipe to make. I’m definitely in the mood for a meal like this and it’s meaty enough for the guys! What I love about jambalaya is that you just toss everything in the pot and that’s it. So packed with flavor and quite filling too. I also like that it’s spicy. Thanks for the recipe! This looks DELICIOUS! I wonder if you could use Italian seasoning, instead of all of the other seasonings? Easy one dish meal! I love jambalaya and I usually experiment with different kinds of meat. I will try your recipe too! Jambalaya has been one of my favorite dishes forever. My grandmother is from Louisiana so it is something that we could make together. This looks incredible! I am going to try this for dinner. It will be perfect to warm us up with the frigid weather we’ve been having. I love this kind of food, it’s nice to have for a change! This looks so amazing, I want to try this recipe ASAP! omg this looks so yummy! need to try some one pot recipes soon! This looks really good! I haven’t ever tried making this before – but I will have to try this easy recipe. Thanks! My husband loves this dish. Maybe I will make it for him. I am on a meat fast most meats apart from chicken…so I love this easy chicken Jambalaya recipe woot. 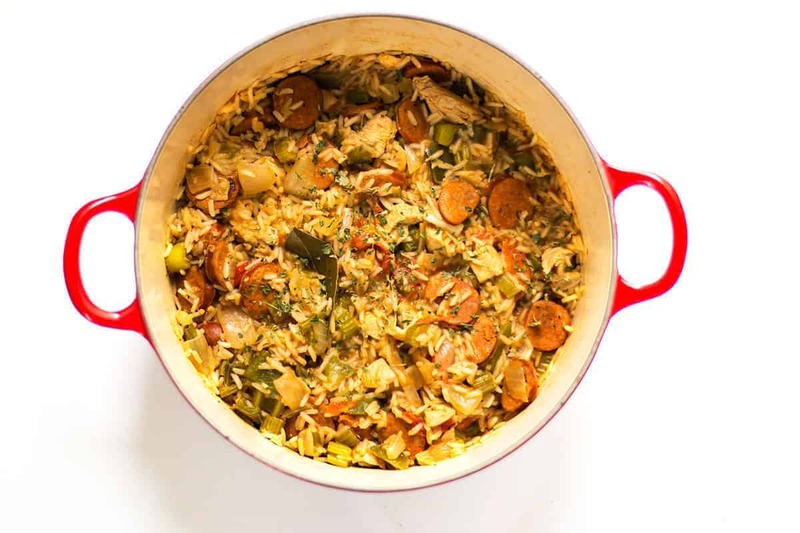 I can make some delishh sunday roasts with this jambalaya…and it has some green yayy! 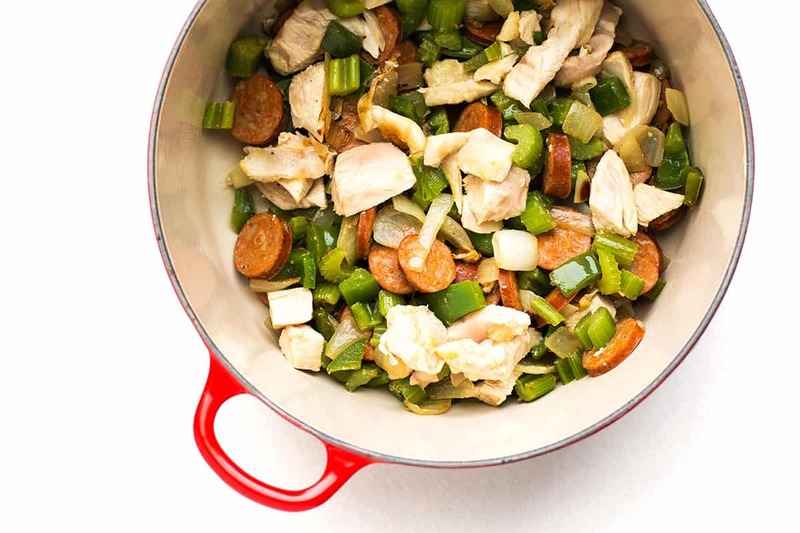 This one pot Jambalaya is a great idea. It looks delicious and very creative. I love jambalaya so so much! We try to go to NOLA at least once a year and basically only eat bowls and bowls of it lol! This sounds delicious and as a veggie I can adapt it by adding quorn sausage and quorn chicken! I really like easy recipes. Love that! Can’t wait to try it. I love Jambalaya and I love that this is so easy to prepare. I need to try your recipe. I love jambalaya but I’ve never tried making it at home. The ingredients look easy and I think it’s something my whole family would enjoy. Thanks for sharing! This looks so good! I don’t usually have Jambalaya because a lot of places put shrimp in it as well and I am allergic. Thanks for this seafood-free recipe I’ll definitely try it! My brother-in-law makes a great jambalaya, but I’ve always been afraid to give it a try. After reading through your recipe though, I am definitely going to try it. Sounds wonderful and looks amazing! I love a good jambalaya and this version does look simple to make! It’s the combination of the spices that really makes the dish! Nice recipe, we need to try this. I am going to smuggle the ingredients in to the shopping basket next time we need groceries. This is another chicken recipe that I can make for my son. Thanks! This was horrible. I wish some of the people above had made it and posted the results.